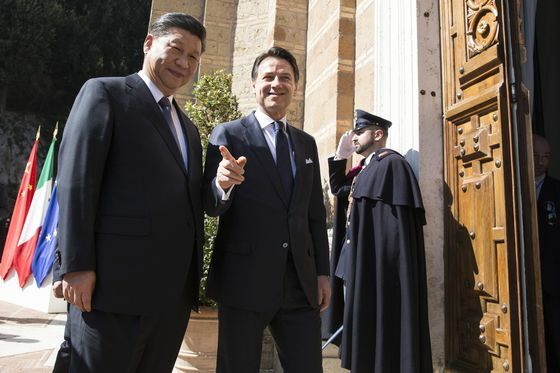 (Bloomberg) -- The landmark accord that Italy signed to join China’s global Belt and Road infrastructure project embraces strategic sectors from telecommunications to energy and ports, despite the unease of U.S. and European allies at the Asian power’s reach. The memorandum of understanding sealed at a Rome ceremony with Chinese President Xi Jinping on Saturday urges stronger cooperation to improve connectivity between Asia and Europe in a range of sectors including finance, according to the seven-page text of the accord published on the website of the economic development ministry. Here are the main points of the deal. The signatories pledge to work together within the Asian Infrastructure Investment Bank (AIIB), a Beijing-based multilateral development bank that started operations in 2016. Critics say that the goal of the AIIB is to expand China’s political clout throughout Asia. The two countries also say they favor “partnerships between the respective financial institutions” to jointly support cooperation on investments and funding. The accord recalls European Union agreements on cooperation with China, and EU priorities on investment and transport networks across the continent. Italian leaders have insisted that this memorandum gives much more space to EU principles than similar accords signed by other member states with China in the past.